Jarrell “Big Baby” Miller is one of many people who absolutely loved the passionate speech Deontay Wilder gave a reporter about how black people have been oppressed and mistreated in the U.S. While he liked the speech, he also called out the WBC Champion for his hypocrisy in the fact that he visited with President Donald Trump earlier this year, claiming he undermined his own message with that meeting. 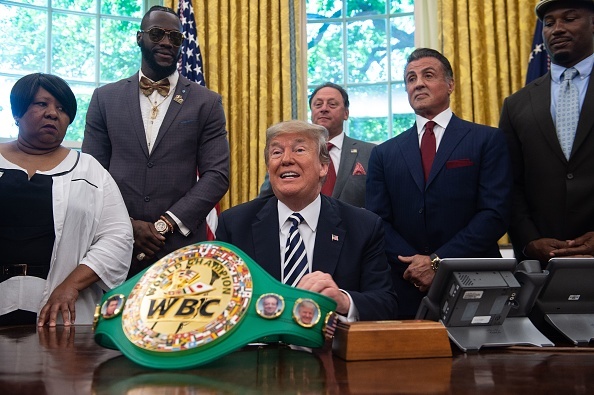 “Wilder had visited Trump’s White House with Sylvester Stallone and others as part of group paying homage to Jack Johnson … after President Trump pardoned the late boxer for a 1913 conviction many believe was racially motivated. Miller — a legit Top 5 heavyweight contender who’s lined up to fight either Wilder Or Anthony Joshua this year — says Wilder got used by Trump to curry favor with African Americans … and it’s a stain on his public image. Miller sees this as Deontay talking out of both sides of his mouth, and although he loved Thursday’s rant, he’s got a message for Deontay when it comes to racial issues.